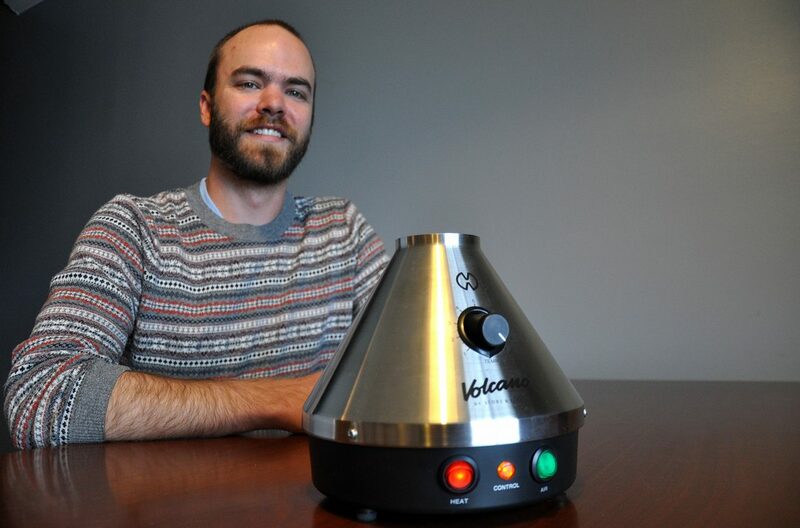 Drew Koehler poses with one of the Volcano vaporizers he is renting out through his company, Steamboat420. Steamboat Springs — Steamboat Springs has never seen a business like this before. Local entrepreneur Drew Koehler is hoping to tap into the state’s lucrative recreational marijuana industry with his new vaporizer rental business that he says offers visitors a healthier and more discreet way of getting high. Tourists and locals rent skis, bikes and other things when they come to Steamboat. “We saw space in the market,” Koehler said. “When I first moved to Steamboat, I was searching for Volcano vaporizers, and I couldn’t find them. I could only buy them online. I thought it would be really great if I could rent one just like skis or a bike. Koehler recently launched Steamboat420, a business that rents out Volcano vaporizers to tourists and locals. Although vaporizers can be used for more than consuming marijuana, Koehler expects most of the customers will use the device to consume marijuana in the form of vapor. Koehler’s sales pitch is that vaporizers are healthier to use than smoking marijuana because users are not ingesting the chemicals they would if they used something like rolling papers to smoke marijuana. Vaporizers also are more discreet because they produce less odor. “We want to promote the idea of using vaporizers rather than tourists buying items to smoke marijuana, because ash falls out and burns the upholstery on your couch, and residue gets left behind. None of that happens with vaporizers,” Koehler said. Steamboat420 delivers the Volcano vaporizer along with a kit and instructions in a small black duffel bag. The company offers 24/7 tech support to customers in case they have questions using it, and if the renter likes it, there’s an option to buy it. Using heat, the vaporizer converts substances like marijuana into a vapor that fills a plastic balloon on top of the device. The marijuana does not combust like it does when it is smoked. The devices retail for hundreds of dollars apiece online. The current price for a rental in Steamboat is $39 per day, but like the cost of lodging, the rental pricing will be dynamic and increase when the demand is higher. Steamboat420 is hoping to launch a program for condominium owners to promote vaporizers as an amenity for their guests. It also hopes to develop a relationship with local dispensaries. Vaporizer users should check with hotels and property owners for their rules on consuming marijuana. Marijuana cannot be consumed in public and is legal for adults 21 and older. Koehler, who moved to Steamboat in February from Minnesota, has pursued a number of small business ideas including a scooter rental company here. He said the vaporizer business is his favorite idea he’s had yet.